The boys and I dodged fallen cables and took pictures of fallen trees. Whoa! We have several similar trees in our neighborhohod, many fell during the snowstorms, but none are as big as this one! These trees remind me of David Wiesner’s picture book Hurricane (as Doug above mentioned). Oh, and I’ve been also wondering the same thing as lmc — all these fallen trees seem to have very shallow roots. (sorry for the cross-comment citing marathon, I guess I’m in academic mode today). I’m no aborist, but my understanding is that lots of water=shallow root system. This might be grounds for not watering the trees too much, but if the reason that the tree has lots of water is that it rains a lot and is humid in summer (so the ground doesn’t dry out quickly), then trees will have shallow roots. In the big park near where I live trees fall down every time there’s a storm, and no one waters them at all- they are basically wild, as it’s a wild area of park. If that’s right then there’s not much you can do about the trees having shallow roots in the N.E., as there’s usually plenty of water for them without having to put down deep roots. Apparently, overhead wires are much stronger than I figured them to be. No kidding, MH; I’m looking at this, and find it hard to believe they didn’t snap. Forest ecologist here. All trees have extensive roots near the surface *and* deeper roots. That’s not to say that a tree’s deeper roots can’t weaken because of disease or other stress or break off because of wind. 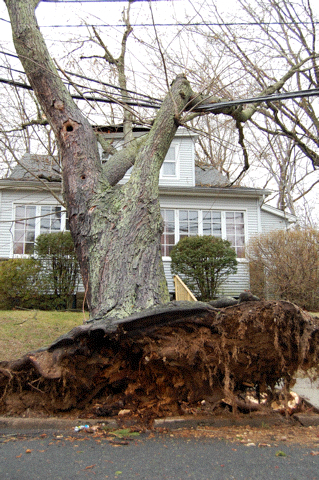 Damage to suburban trees may relate to them being artificially planted in the open and more exposed individually to wind gusts rather than sheltered by neighbors. Or, it’s likely that there is plenty of damage to trees in forests from this weekend’s storm and people just don’t see it or care because those trees didn’t rip through electrical systems and houses. Bottom line: strong winds knock down trees. Always have, always will. Also, power companies are probably starting to extensively reinforce wires to limit the danger and liability associated with them snapping in the ever-more frequent ‘worst in a decade’ storms we’ve been experiencing in the last 15-20 years. Yet another cost of climate change that’s being passed along to the customer.